There, that got your attention. It’s not completely true, as in, we’ll be defending some other people as well. I am troubled by the constant references to Mr Pickles’ girth. Whether it is Nick Clegg saying that Eric Pickles is the only cabinet minister who can be seen on Google Earth or Greg Clark talking about the heavyweight presence that Local Government has at the Cabinet table, people enjoy a laugh at him, and at John Prescott before him. This Billy Bunter style humour is unhelpful at best and possibly destructive, being redolent of Form 4B on a Tuesday afternoon. People might say that he will laugh it off, and it is a bit of a joke and not serious, and he should develop a thick skin. As a fattie in my younger days, I can tell you that it isn’t a joke, he shouldn’t have to laugh it off and why should he develop a thick skin. It is unpleasant to know that when you wake up in the morning, you know what will happen. Fattism seems to be the acceptable face of bullying in public life. I wonder how long it might be before this gets referred to the Equality and Human Rights Commission? And whilst this is an issue for Mr Pickles and Lord Prescott, this distracts attention from the impending obesity crisis that we are facing. Whilst we maintain an adolescent and puerile approach to obesity, we won’t get anywhere near sorting it out as a major public health issue. The reasons that people are overweight are many and complex, much as those reasons as to why people are underweight and malnourished. Understanding those reasons and looking to address them rather than resorting to fattie jokes surely has to be the best way. Building decent sized kitchens would be a good start as well as ensuring that people can access good quality and reasonably priced food and have the ability to store it and the confidence to cook it. The reasons are many and complex and are not just about eating too much chocolate, although this might have something to do with it for some people. Judging less and understanding more would be a good place to start. So Mr Pickles, there are many things that I might not agree with you on, as with Lord Prescott. However, I will defend you against the jibes about your weight as this is unfair and you do not deserve it. The issues on this are far too serious for us to trivialise them in this way. This entry was posted on March 6, 2012 at 6:11 am and is filed under Big P Politics, We love the Council. You can subscribe via RSS 2.0 feed to this post's comments. I have to say I’m glad to see this post. While no defender of his politics, I’m very uncomfortable at the ease with which people (including his own side) target him on the basis of his looks. It feels petty but it also indicates a societal attitude to obesity which makes it an easy target. Agreed – we’d much prefer people to criticise him based on things they disagree with which he has/hasn’t done (which are things entirely within his control) rather than a childish line about his weight (which probably is less in his control). I agree. People who complain about the quality of our politics are often the quickest to seize on cheap shots at their opponents. You don’t do anything to counter Pickles’ approach by sniping at his girth. Besides, it doesn’t take much observation to see that he has a thick skin and a sense of humour – it is easier for him if he only has to fend off fat jokes rather than analysis of his policies. 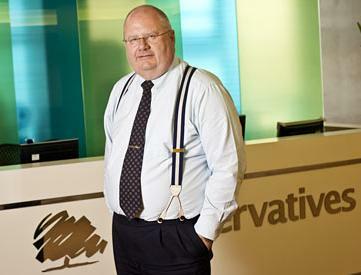 Everyone thinks Andrew Lansley is doomed, but Pickles looks unassailable. It is strange that he gets off so freely when some of his ideas are so frustrating and contradictory, whilst others are pilloried. The constent resort to Pickles size is at best tiresome and unfunny. Given the rich vein of material from the stuff he says it must surely be worthwhile making the effort to makes jokes about his views rather than the view of him. Too true – and with the rate at which he comes out with new and seemingly random points of attacking local government there is far more range available to laugh at policy rather than physical appearance. Variety is the spice of life after all!